Mosque of Kūfa (Arabic: مسجد الکوفة) is a great mosque in the Islamic world. For Shi'as, it is the fourth important mosque after al-Masjid al-Haram, al-Masjid al-Nabi, and Masjid al-Aqsa. 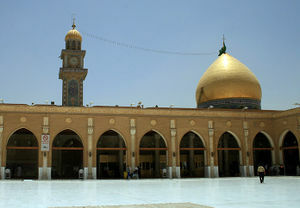 It is also the oldest and the most important visiting place in Kufa. According to some hadiths, the first person who founded the Mosque of Kufa was Prophet Adam (a). It was reconstructed by Prophet Noah (a) after the storm. In 17/638, when Muslims first entered Kufa in the period of Sa'd b. Abi Waqqas, the mosque was rebuilt together with the governmental building (Dar al-'Imara) at the suggestion of Salman al-Farsi. The mosque has witnessed many prophets (a), Prophet Muhammad (s), Amir al-Mu'minin (a), Imam al-Hasan (a), and Imam al-Husayn (a), and some other Imams (a). In 36/656-57 when Amir al-Mu'minin (a) attended the mosque, it became much more important. He frequently led congregational prayers in this mosque, delivered sermons on its minbar, fulfilled some governmental and judiciary tasks there, and was finally martyred in its mihrab. The mausoleum of Muslim b. 'Aqil, the mausoleum of Maytham al-Tammar, the house of Amir al-Mu'minin (a), the governmental building of Kufa, the mausoleum of Hani b. 'Urwa and al-Mukhtar al-Thaqafi's grave are located near the Mosque of Kufa. The mosque has in it a number of positions, in many of which some spiritual practices of the mosque are performed. Just as travelers have the option to say their prayers fully or in a shortened form in al-Masjid al-Haram, the Holy Shrine of Imam al-Husayn (a), and al-Masjid al-Nabi, they have the same option in the Mosque of Kufa as well. There are many hadiths regarding the merits of this mosque. According to some hadiths, the Mosque of Kufa is a garden of the Heaven. If one enters the Mosque of Kufa, one will be forgiven. Kufa will be the center of Imam al-Mahdi's (a) government, and the Mosque of Kufa will be the headquarter of his command. Kufa is a city in Iraq located in the south of the country, ten kilometers on the northeastern side of Najaf. The city was built near Euphrates, it has a temperate climate, and has for long been green. Kufa was first known as "Suristan". In 17/638, months after the construction of Basra, Sa'd b. Abi Waqqas built Kufa at the command of the Second Caliph as a residence for soldiers and military forces as well as their families during conquests. Soon did Kufa turn into an important Islamic city. It underwent many events. The great mosque of the city in which Imam 'Ali (a) was martyred was built in this period. One of the oldest and most important visiting places in Kufa is the great Mosque of Kufa. The mosque is one of the greatest mosques in the Islamic world, and the fourth important mosque for Shi'as (after al-Masjid al-Haram, al-Masjid al-Nabi, and al-Aqsa mosque). The Mosque of Kufa is with 110 meters of length, 101 meters of width, and has an area of 11162 square meters. Its walls are ten meters hight. The open courtyard of the mosque is 5642 square meters, and the area of its Shabistans is 5520 square meters. The number of its pillars is 187, and it has four minarets each 30 meters tall. The mosque has five gates called: "Bab al-Hujja" (the main entrance), "Bab al-Thu'ban", "Bab al-Rahma", "Bab Muslim b. 'Aqil", and "Bab Hani b. 'Urwa". According to some hadiths, the construction of the mosque dates back to Prophet Adam (a). It was later reconstructed by Prophet Noah (a) after the storm. Salman departed from the western bank of Euphrates and Hudhayfa departed from its eastern bank. They did not like any land until they arrived in Kufa. They both found the land appropriate as a residence for the army. They said two rak'as of prayer and asked God to make the place peaceful and stable. When Sa'd b. Abi Waqqas and his army arrived in Kufa, he ordered the construction of a mosque before making any other constructions. Abu Hayja' al-Asadi stood in a place and threw arrows to all directions in order to specify the area of the Mosque of Kufa. The Mosque of Kufa was, since its construction, a cultural center of the city. When Imam 'Ali (a) arrived in Kufa in 36/656, he first went to the Mosque of Kufa and delivered a speech for people there. After settling in Kufa, the Imam (a) taught the exegesis of the Qur'an and other sciences in the mosque. Many people attended his lectures in this mosque, such as Kumayl b. Ziyad and 'Abd Allah b. 'Abbas. Asbagh b. Nubata says: addressing people of Kufa, Amir al-Mu'minin (a) referred to the Mosque of Kufa as "the house of Adam (a), place of Noah (a), residence of Idris (a), worshiping place of Ibrahim (a) and my brother, Khidr (a)" and "one of the four mosques selected by God for His people". The Imam (a) also predicted that the Black Stone (al-Hajar al-Aswad) will be installed in this mosque. There will be, he said, a time when the mosque will be the worshiping place of Imam al-Mahdi (a) and every believer. Heavenly Castle: according to some hadiths, the Mosque of Kufa is a "castle of the Heaven". Place of Sujud for the Angels: according to hadiths, the angels worshipped God in this sacred place before the creation of Adam (a). According to a hadith from Imam al-Rida (a), the Mosque of Kufa is of such a high ranking that once a person enters it, his or her sins will be forgiven. Place of Prayer for Prophets: Abu Basir quoted Imam al-Sadiq (a) as saying about the Mosque of Kufa that: "the best mosque is the Mosque of Kufa: one thousand prophets and one thousand saints have said prayers in it …". Prayer in the Mosque of Kufa Can be Said Fully during Travels: when a person travels to a place without intending to stay there for ten days, they should say their prayers in a shortened form, except in four places, one of which is the Mosque of Kufa. Saying Prayer in the Mosque Equals Hajj: Imam al-Baqir (a) says about the merits of saying one's prayers in the Mosque of Kufa that: "if people knew how much merit it has to say prayers in the Mosque of Kufa, they would go there from distant areas. Truly, saying one's obligatory prayers in this mosque equals hajj and saying recommended prayers there equals 'Umra. Superior to All the Mosques: Imam al-Sadiq (a) takes saying prayer in the Mosque of Kufa equal to one thousand prayers in another mosque. Also, Imam al-Rida (a) says about saying prayers in this sacred place: "saying an individual prayer in the Mosque of Kufa is superior to seventy congregational prayers in another mosque". The Sanctuary of Imam 'Ali (a): a hadith is cited in Bihar al-anwar from Imam al-Sadiq (a) according to which Mecca is the sanctuary of God, Medina is the sanctuary of the Prophet Muhammad (s), and Kufa is the sanctuary of Imam 'Ali (a). Imam 'Ali (a) made that much of Kufa as his sanctuary that Ibrahim (a) has made of Mecca, and Muhammad (s) has made of Medina. Burial Place of Prophets and Divine Saints: many prophets have said prayers in Kufa and in the Mosque of Kufa. Up to 370 prophets and six hundred saints are buried there. Center of Imam al-Mahdi's (a) Government: according to Imam al-Baqir (a): "when our Qa'im (i.e. Imam al-Mahdi (a)) starts his uprising and goes to Kufa, there will be no believer unless he resides in the city near him or goes to the city". Amir al-Mu'minin (a) said: "a time will come when this place (the Mosque of Kufa) will be a place for the prayer of Imam al-Mahdi (a)". Residence and place of sujud for Noah. Seventy thousand people will be resurrected on the Day of Judgment in this place and will go to the Heaven without any calculations. It counts as a worship to only sit in the Mosque of Kufa without reciting the Qur'an. There are places in this mosque which are attributed to prophets (a) or prominent religious figures. These are called "Maqam" (position). Some recommended prayers or practices are recommended for some of these positions. Rahba Amir al-Mu'minin: in front of the Mosque of Kufa where the gate of the mosque is located, there is a bench on which Imam 'Ali (a) sat and answered people's questions. It is mentioned in some hadiths. Dakka al-Qada': this is the place where Imam 'Ali (a) adjudicated legal cases. There was a short pillar in this position on which the following Qur'anic verse was written: "Surely Allah commands justice and good deeds". Bayt al-Tasht: this is a place where a miracle by Imam 'Ali (a) occurred. Position of Adam (a): the seventh pillar of the Mosque of Kufa is known as the position of Adam (a). This is believed to be the place where God accepted Adam's (a) repentance. Imam 'Ali (a) said his prayers near this pillar, which is why it is also known as the position of Amir al-Mu'minin (a). Position of Ibrahim (a): the 4th pillar of the mosque near "Bab Anmat" is a place where the prophet Ibrahim (a) is believed to have said prayers. Position of Jabra'il: the fifth pillar is attributed to Gabriel. In the night of Mi'raj when the Prophet (s) was moving from al-Masjid al-Haram to al-Aqsa Mosque and arrived in Kufa, Jabra'il told him: "O the messenger of God, you are now across from the Mosque of Kufa. The Prophet (s) asked for God's permission and said two rak'as of prayers there. Imam al-Hasan (a) also said prayers near this pillar. Thus, it is also known as the position of Imam al-Hasan (a). Position of Imam Zayn al-'Abidin (a): the third pillar is where Imam al-Sajjad (a) said prayers. Abu Hamza al-Thumali says: I saw 'Ali b. al-Husayn (a) (that is, Imam al-Sajjad) entering the Mosque of Kufa, saying two rak'as of prayers, and then praying to God. After a while, he headed home to Medina. He was told why he had come to that place where his father and grandfather were killed. He said: "I visited my father and said prayers in this mosque". The Place where Amir al-Mu'minin (a) was hit. Mihrab of Amir al-Mu'minin (a): this is the place where Ibn Muljam al-Muradi hit the Imam's (a) head and martyred him. Position of Imam al-Sadiq (a): a person reported: "in the Abbasid period, I once saw Imam al-Sadiq (a) entering the mosque from Bab al-Fil and saying prayers near the forth pillar. The place where Noah's ship ran aground. There are recommended practices for the Mosque of Kufa, including ziyara, prayers, and specific supplications mentioned in the practices of the Mosque of Kufa in Mafatih al-jinan. Mausoleums of Muslim b. 'Aqil and Hani b. 'Urwa: after the martyrdom of Muslim and Hani, the Midhhaj tribe received 'Ubayd Allah b. Ziyad's permission to bury their corpses near the governmental building. The place might have been selected because their graves as well as Shiite come-and-goes could be monitored by the government. Until 65/684, their graves had no sunshades. In 65/684, al-Mukhtar al-Thaqafi constructed a mausoleum and a dome for their graves and inscribed their names on a marble which was installed on their grave. The Grave of al-Mukhtar al-Thaqafi: al-Mukhtar al-Thaqafi's grave is also located near the Mosque of Kufa close to that of Muslim b. 'Aqil and Hani b. 'Urwa. According to a number of hadiths, Kufa will be the center of the global government of Imam al-Mahdi (a). Mufaddal b. 'Umar asked Imam al-Sadiq (a) about where Imam al-Mahdi (a) will govern. He replied: the center of his government will be Kufa, his governmental building will be the Great Mosque of Kufa, and his treasury (and the place where booties of wars will be distributed) will be the al-Sahla Mosque. Development of mosques, especially the Mosque of Kufa: since many Shi'as will go to Kufa from different areas in order to see Imam al-Mahdi (a) or stay near him and in order for the Shi'as to easily attend congregational prayers behind the Imam (a), the mosque will be developed, one thousand gates will be opened to the mosque, and the Imam (a) will concern himself to develop all the mosques, and in particular, the Mosque of Kufa. The Mosque of Kufa as a Center for Imam al-Mahdi's (a) Judgeship: Imam al-Sadiq (a) said: "the center of Imam al-Mahdi's (a) government will be in Kufa and the center of his judgeship will be the Mosque of Kufa". The material for this article is mainly taken from مسجد کوفه in Farsi WikiShia. This page was last edited on 27 February 2019, at 08:11.